A Norway-based oil and gas company finalized its decision to construct the world’s largest floating wind farm off the coast of Peterhead in Aberdeenshire, Scotland. 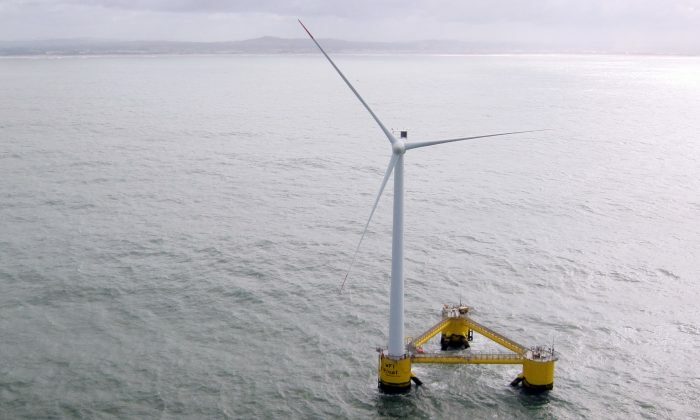 Statoil, a leading supplier of natural gas to the British market, announced Nov. 3 it will launch its company-owned-and-developed offshore wind technology called Hywind with the installation of a 30-megawatt (MW) floating wind turbine farm. The technology has successfully operated for six years as a prototype in Norway. The energy giant’s executive vice president for New Energy Solutions, Irene Rummelhoff, said the new facility would further increase the global market for offshore wind energy. “Our objective with the Hywind pilot park is to demonstrate the feasibility of future commercial, utility-scale floating wind farms,” she said in a press release. With fixed turbines, offshore wind is optimal at water depths of 20–50 meters (65–164 feet). The benefit of floating structures is to enable further expansion in new deep-water areas around the world. The idea of revolutionizing the wind industry with floating wind turbine technology has also reached the United States. Oregon-based Windfloatpacific is gearing up to launch a floating wind farm pilot project off the coast of Oregon using the WindFloat technology developed by Principle Power. The Oregon project, funded by millions of dollars in federal grants, is also expected to increase competition in the energy market. It’s touted as helping stimulate job creation, economic growth, and cleaner air and water. It’s expected to be operational by the end of 2017. Although offshore wind energy is fairly new to the United States, it is among Europe’s fastest-growing energy sources, with 10 GW installed capacity already. Offshore wind has a global potential to reach more than 100 GW by 2030, says Statoil. The Scottish government, which considers itself an energy sector expert, welcomed Statoil’s arrival. “It’s a real testament to our energy sector expertise and skilled workforce that Statoil chose Scotland for the world’s largest floating wind farm,” remarked Scotland’s Deputy First Minister John Swinney in the release. Statoil is already working with several Scottish suppliers and partners on the project, and expects it will provide additional jobs in Scotland and other countries. Production is scheduled to start in late 2017.